The springtime is often the best time of the year for cleaning up and getting rid of old items, but with its proximity to the winter months it can still be hard to commit to large-scale renovations. If you’re looking for some small fixes to give your home a seasonal boost, here are a few options that won’t take up a lot of time. Paint can instantly enhance the brightness of any room, but deciding to repaint can be a job that takes more than just a weekend. Instead of committing to everything, paint your window frames for a task that is cheap and doesn’t require a huge expenditure of time. Since the eyes will naturally be drawn to the windows in any room, this will serve to improve your space without all the work that goes into sanding and taping everything. A creative, striking way to upgrade the look of your home is a wallpaper accent that will be easy to install but add trendy appeal to your home’s aesthetic. Instead of going for the same old, choose a wallpaper with a funky design to the area of your choice. By placing it behind a mirror or another picture, you’ll add a lot of oomph without all of the effort that goes into completely repapering a wall. It’s just important to ensure you use an adhesive wallpaper that can be repositioned in the event your first attempt doesn’t work out. It doesn’t necessarily take a lot of legwork to easily revamp a stale space, so consider a light fixture that will instantly draw the eye and can serve as a high-impact piece that really sets the tone for your chosen space. While you’ll want to choose something that won’t completely contrast with the style already present, the right piece can really enhance and modernize what you already have. It’s just important to turn off the breakers before you start fiddling around with installation. 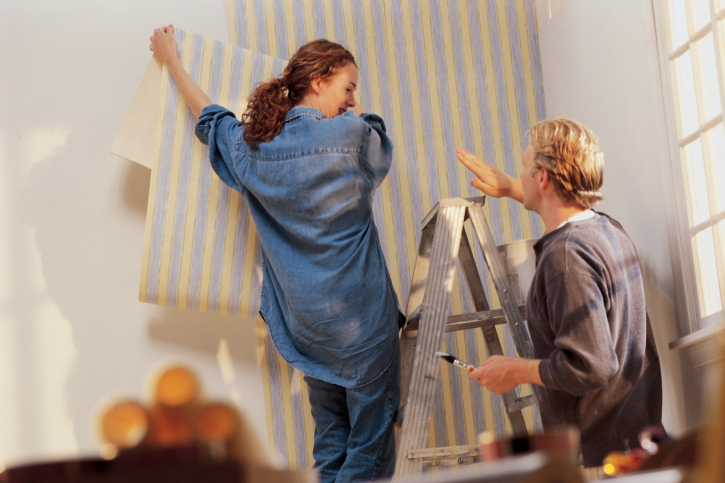 The idea of home renovations can make people think of large scale projects that consume a lot of time, but there are plenty of little things to be done that will make for big changes without an excess of effort. If you’re making some upgrades want to see options for financing, please contact us for more information. This entry was posted in Around The Home and tagged Around The Home, Home Upgrades, Weekend Renovations by BJ Kirkpatrick. Bookmark the permalink.